Enjoy the relaxing coastal vibe of the North Coast Region of Manistee County. This region is comprised of three small communities: Arcadia, Onekama and Bear Lake, each offering a charming selection of family-owned shops and restaurants, farm stands, diverse waterways, and quaint, small-town appeal. The North Coast Region runs along 25 miles of Lake Michigan Shoreline in Manistee County and is the perfect location for those looking to get away from the hustle and bustle to enjoy a restful retreat. Choose the North Coast Region and get ready for toes in the sand, the soothing sound of waves as they meet the shoreline, abundant opportunities for paddling, boating or fishing, and epic sunsets that will keep you coming back time and again. The Historic Portage Point Inn is a gem of the North Coast Region. 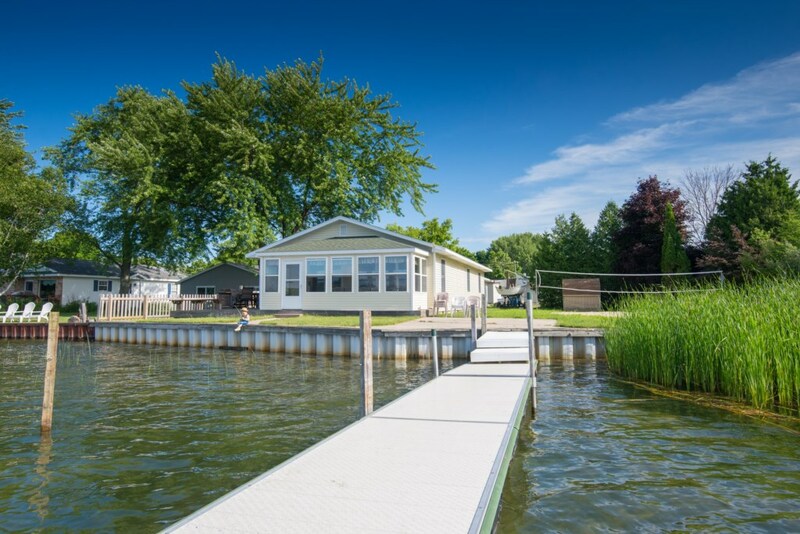 This premier vacation destination is positioned on a wooded peninsula between two lakes, Portage Lake and Lake Michigan, that are connected by a wide navigable channel with miles of sandy dunes and beaches. The lakes, beaches and dunes surrounding the resort are as captivating today as they were back in the early 1900's when steamships arrived from Chicago. Since 1902, generations of families have come to Portage Point Inn to make vacation memories. Now a year-round resort, the guests of Portage Point Inn who have always enjoyed the busy summer season, can now to take advantage of the splendor of fall color tours, renewal of spring, and the quiet, peaceful grace of winter. * Please note that CENTURY 21 Boardwalk Vacation Rentals is not affiliated with Portage Point Inn Ownership and Management, and therefore certain amenities will be off limit to our guests. Acadia Piper - At Arcadia Bluffs Golf Club, Stephen MacNeil, a Scottish bagpiper in full regalia, offers his one-of-a-kind greeting to twilight an hour before sunset on Friday, Saturday and Sunday evenings from June through September, weather permitting. Manistee County has two popular artesian wells which have been enjoyed by locals and visitors for many years. These two water sources are considered to produce some of the purest water in the county, Old Facefull near Pierport, north of Onekama and Portage Point Well: Located at the corner of M-22 and Portage Point Drive. Driving north through Manistee County on the beautiful Scenic Highway M-22, you will find yourself “on top of the county” when you reach the Arcadia Overlook. Leaving Arcadia your car will kick into overdrive as you climb 370′ to the parking area at the Arcadia Overlook. Now, if that isn’t enough of a view for you, hopefully you have your walking shoes on. Climb 120 steps (a little over 80 vertical feet) and you will find yourself perched on the highest point in Manistee County. Take time to pause, reflect and enjoy the simple beauty of Manistee County’s natural landscape. 4604 Main Street, Onekama - (231) 889-3734 -Offering distinctive, casual, lakeside dining since 1994. Located in a historic 1920’s resort on M-22 in Onekama, the restaurant overlooks gorgeous Portage Lake and its channel to Lake Michigan. Our menu features fresh fish, steaks, chicken, pasta and locally grown fruits and vegetables. In addition to our fresh-made entrees, we offer weekly featured items, homemade soups, specialty appetizers, our popular sauces and dressings, and at least a dozen delectable dessert options daily. We have a complete bar with a large selection of beer, wine, top shelf spirits and specialty martinis. 17073 Northwood Highway, Arcadia – 231-889-4555 – A old fashioned ice cream parlor serving delicious hard & soft ice cream, sundaes, malts, shakes, ice cream sodas, the works! Adjacent to the delightful Lily Pad Gift Shop with clothing, jewelry and more. 7710 Lake St, Bear Lake, MI 49614 - 231-864-1174 - Stop in to this charming bear lake boutique to find the perfect gift, unique home furnishings and beautiful clothing &accessories.